(4) Medicine to cure the disease. The first 2 truths deal with the way things are; the last 2 point the way to freedom from suffering. 1. The Noble Truth of Suffering Besides "suffering," other translations of the Pali word dukkha include unsatisfactoriness, dis-ease, and instability. All these words point to the fact that no conditioned phenomenon can provide true (lasting) happiness in our lives. The first step in a spiritual life is to look very closely and honestly at our experience of life and see that there is suffering. We tend to overlook or ignore or just blindly react to the unpleasant, so it continually haunts us. 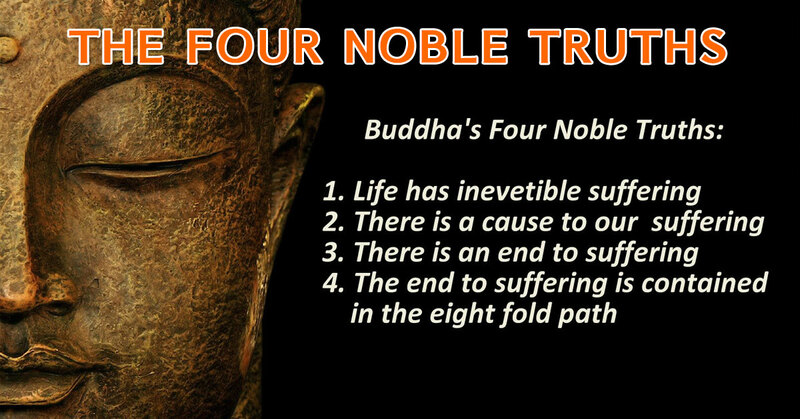 Yet although physical suffering is a natural aspect of our lives, we can learn to transcend mental suffering. 2. The Noble Truth of the Cause of Suffering Through a lack of understanding of how things truely exist, we create and recreate an independent self entity called "me." The whole of our experience in life can be viewed through this sense of self. In consequence, various cravings govern our actions. Cravings arise for sense experiences, for "being" or "becoming" (e.g. rich, famous, loved, respected, immortal), and to avoid the unpleasant. These cravings are the root cause of suffering. 3. The Noble Truth of the Cessation of Suffering The mind can be purified of all the mental defilements that cause suffering. Nibbana, the ultimate peace, has been compared to the extinction of a three-fold fire of lust, ill-will, and delusion. One who has realised cessation has great purity of heart, ocean-like compassion, and penetrating wisdom. (1) comprehended, (2) abandoned, (3) realized, and (4) developed.